I used to see dogs in Prospect Park, wearing an extra collar around their neck, and thought it was because of extensive barking. By now, I’m very much aware of the use of e-collars in off-leash training (especially for hunting dogs) and the controversies and potential dangers of this. 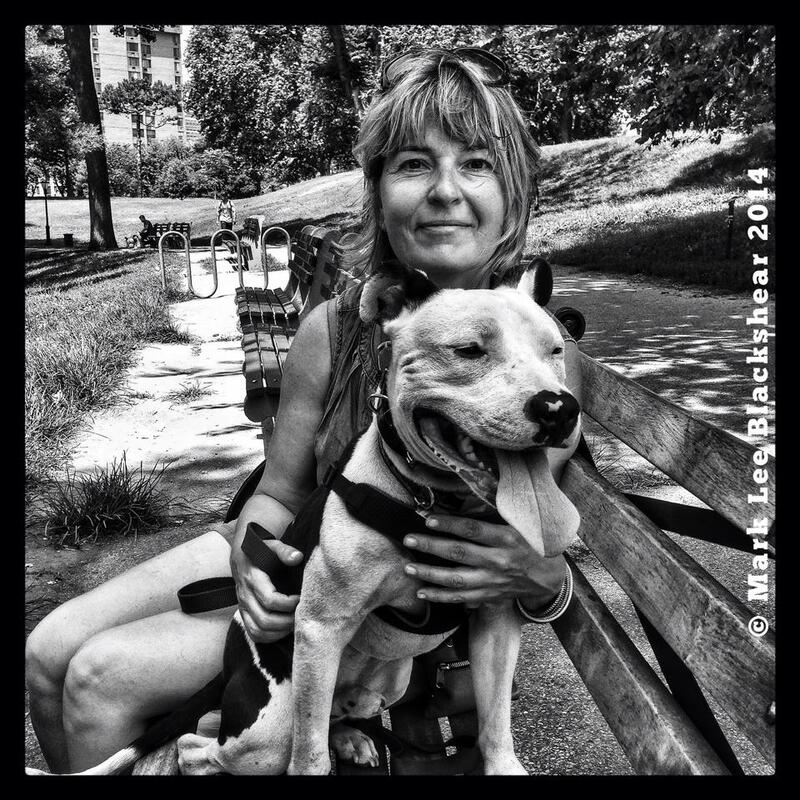 As I have written here before, when adopting T we were told by the assessors at the shelter that he’s submissive (and house-trained and…). Very soon we discovered that clearly that was not the case. We were recommended a trainer by several people — whom we knew already by his fantastic reputation. We were lucky to get him to work with us. After evaluating T he noted that much of T’s aggression is about insecurity and about not having been socialized with other dogs. Given that we live in the city with very few off-leash opportunities without other dogs, he recommended the consistent use of the e-collar when we are outdoors for the next 6 months. He trained us on how to use the collar in 2 sessions at home, and then in 8 sessions in the park. This, however, doesn’t mean that T gets every ‘correction’ through the e-collar. This means that he wears it — and if he’s about to initiate a fight, we can be sure we can call him back before anything happens, i.e., as a preventive measure. (If there’s a confrontation already happening, using the collar might just aggravate the situation, make the dog more aggressive.) That said, using the collar to call T back has to be the last resort, after normal recall, so that T won’t become confused and fearful of all his actions. 25 min. on-leash walk to the park. 15 min. walk around the park. We keep moving and, at this stage of the events, avoid big packs of dogs that are playing rough. T meets dogs one-on-one that he encounters while we stroll around. It’s clear to me that he’s still a bit unsure about all the dogs around, the barks, the action — he tends to follow The Mu everywhere, as in search for guidance. 10-15 min. for some more recall, or sleep, or rollover, or (if there’s space) chasing the ball. 5-10 min. final off-leash exploration. 25 min. on-leash walk home. Yes, it’s a long morning. But we are starting to see the results, that is, a more relaxed, happy dog — only after a few weeks of training. Yet, the e-collar is not THE CURE here. It’s simply the safety mechanism that allows us to slowly introduce T to existence where he doesn’t need to react to other dogs. Shock collars are not magic and they do not deliver a touch. 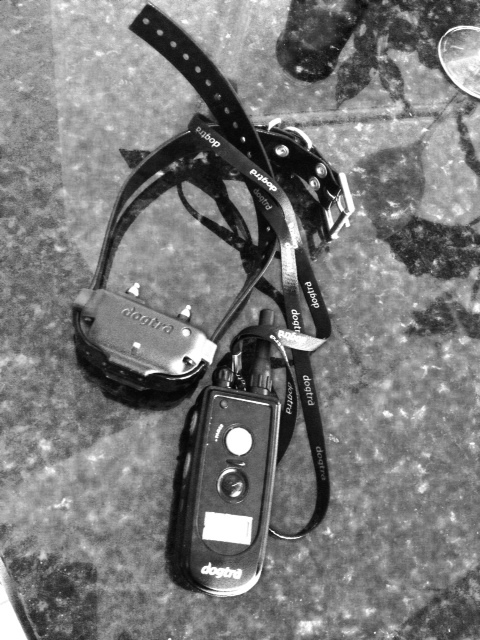 We may use terms like gentle training collar or gentle current but that does not change the true nature of shock collars. If we want to use a shock collar, then we should accept it for what it is. In my world, honesty is the only policy. If you want to fix a problem, you must work to a goal of 100% effectiveness. You must be consistent and patient. Everyone wants things to happen overnight but that’s never the case. You must be honest with what is working and be versatile in your approach. Recognize things as they are and not how you want them to be. We had to recognize how T really was, and what we had to do to be able to keep him, and to keep him and other dogs safe. For now, one of the tools is the e-collar.